And doesn't that little enamel heart look so sweet? The circles are diecut from a Lil'Inker die , as is the rectangle mat. Easy peasy! Enjoy your day and be sure to come back tomorrow for a new Paper Players challenge! Cassidy is on vacation this week, so no photos unless I get some via Facebook, LOL! I'll leave you with our little wrens who just today are trying to fledge....it's a slow process! Momma keeps trying to encourage them with some treats, but they are still hovering inside where it's safe! Absolutely love wrens!! You never can tell where they'll nest!! Cute card LeAnne! Love your bird pics! Such a clean and vibrant card! With the red apple and the school note paper, it would make also make a great teacher card, with a different sentiment. So pleased that you've joined us again at As You See It. Lovely clean card LeAnne. The colours and design are so crisp and match the apple perfectly! 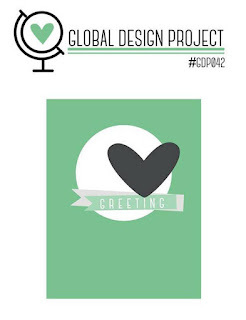 Thanks so much for joining in with this week's Global Design Project! LeAnne, what fabulous photos of your little wren. Especially when they are nesting in that adorable little house! Love your card, too. Perfect clean and simple card and I love the sentiment! Hope you enjoyed the cookout! Thanks for sharing your design with us at As You See It Challenges this time. Sweet card - I love the red-and-white color scheme. So clean and sweet. Love the bird pics, too! Thanks so much for playing along with this week's Global Design Project sketch challenge! Look at those birds!!! I love watching birds in my yard. Your red and white card is so perfect for teachers! I love it! Thank-you for playing along with the Global Design Project.